Celebrate the guys in your life at Bromance Monday, one of Brass Tap’s events during their #WeekofLove specials. Grab your girls and head over to another #WeekofLove event at Brass Tap- Midtown. Trivia from at 7pm-9pm and $2 Chocolate Kiss Shots from 7pm to close. 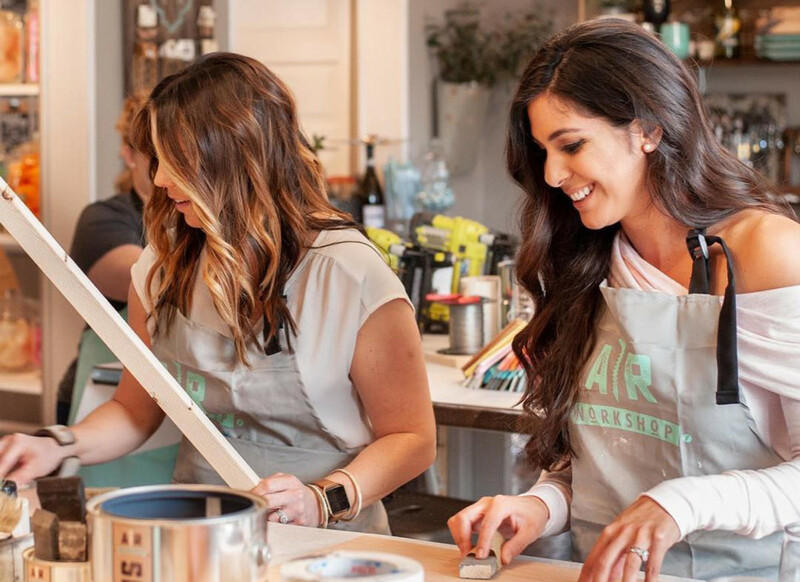 Celebrate Galentine’s Day at AR Workshop Tallahassee by taking a DIY class to make a Plank or Framed Wood Sign, Lazy Susan, Tray, Centerpiece Box, Porch Sign or more. The workshops are BYOB. From 6-8pm, treat yourself, friends, or a valentine while you sip on a glass of wine or local beer, listen to live music, and shop! The free event includes free roses for the first 100 ladies, exclusive sales, food trucks and more. Who doesn’t love Brunch on a Wednesday afternoon? Grab your friends and head over to Madison Social from 11:30am-4pm, for a special Galentine’s brunch with a new and improved cocktail menu. Spend your Galentine’s Day with your thrifty friends and head over to Community Thrift! There will be food and drinks, giveaways, and fun specials! Visit The Refinery and celebrate your girlfriends with some Pink Lemonade, Rosè, and treats! They have certain classes dedicated to you and your girls, raffles, and more. Enjoy a one-of-a-kind experience with Food Network Chopped Champion, Chef Shac, as she creates a 4-course meal and wine selection that will wow your tastebuds. Enjoy this fine dining experience Wednesday-Friday. Seating is limited so get your seat soon! Enjoy a dinner for two at the historic Gardner’s cottage on February 14th from 6:30-9pm. The dinner includes a bottle of wine, choice of entree, and more. Enjoy a romantic dinner at Tallahassee’s newest venue. There are two seating times available for reservations: 6:00PM & 8:00PM and the full dinner buffet includes valet parking, and more. Celebrate love with dinner and dancing from 5-7pm. The dinner will be prepared by Chef Jabari and his culinary team. Make Valentine’s Day unforgettable with a trip to the Historic Capitol Museum for the Sips and Stories Tour. In a casual after-hours experience led by Museum staff enjoy three wine and cheese tasting stations. Reservations are required and space is limited. $20 for Members / $25 for non-Members. Enjoy a crafty night with you loved one. Choose to share a project or each make one! There will be complimentary champagne and food. Read more information about this event here. 14. Gallontines Day at Deep Brewing Co. If you’re looking for something different to do this Valentine’s Day, join Deep Brewing Co. for their third annual Gallontine’s Day event. They will be releasing their “Box of Chocolates” inspired beers and Tally Mac Shack will be making an appearance. A fun night for the artistic couple. You’ll each paint your own canvas and they’ll go together as a set. The night is BYOB. For more details, check out the page here.